I loved Maple Syrup Eggo Cereal so much I wrote a 6 stanza poem about it. Unfortunately, the latest Eggo cereal offering only garners a 3 line Haiku. The new cereal has the same great texture as the original. I especially like the interplay with milk as the center of the cereal pieces soften and the outer edges retain a respectable crunch. Unfortunately, the cinnamon toast flavor doesn't fare as well as the maple version. The flavor feels more dusted on than baked in. Don't get me wrong. It's a decent cereal. I'll finish the box. But the first time out, the Eggo people effectively took their waffle fame and expertise and turned it into a cereal. 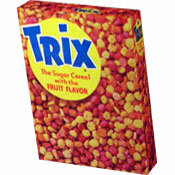 This time out, they took a cereal and just whacked some new flavors into it. It's missing the love. 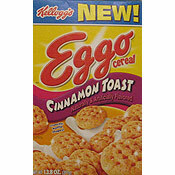 What do you think of Eggo Cereal - Cinnamon Toast? They are off the chain... reminds me of Waffle Crisp but they took those off the market. Note From Mr Breakfast: Hi Kurt - You can still get Waffle Crisp. Here's a link. Cinnamon toast crunch used to be very good. I ate it every morning. But recently it lost it's flavor and tastes like cardboard. I tried many brands and they are all the same. What's up...? Spending too much on commercials and can't afford cinnamon and sugar? I second that "best in the entire world".... Since French Toast Crunch.... It's definately the same recipe. Cinnamon Toast is simply the greatest tasting cereal in the ENTIRE world. This cereal is good enough to eat as a snack without milk! I love this cereal. It was out of this world. Comment from kashiba gibbs, I wish I can get a free box. Ha, ha, ha. Yum! I love ego cereal! So tasty. Very sweet. Go and get a box!